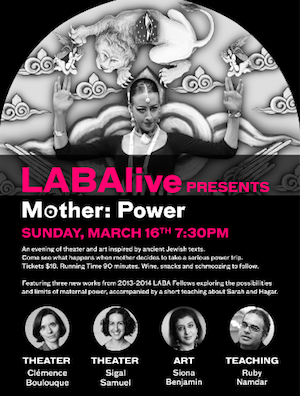 New York's 14 Street Y's LABA Live theme this year is Mother: Power. Sunday, March 16th 7:30 PM. An evening of art, music and theater inspired by ancient texts. "The Four Mothers Who Entered Pardes"
Four cathedral-scale mixed media panels exploring the journey of the four matriachs as they enter the Pardes. Till all children are safe, none are safe. Mothers will find it within themselves to make everything happen. Installation will feature dancing by Bhavani Lee and music by Galeet Dardashit. Tickets $18. Running Time 90 minutes. Wine, snacks and schmoozing to follow. A Talmudic tale teaches us that when four male sages enter a mystical garden, it destroys their lives forever. But what would happen if the four biblical matriarchs entered it instead? Sigal Samuel's new one-act play looks at just that. Who are the mothers who never had children? Through a monologue about Regina Jonas, the first woman rabbi who was ordained in Berlin in 1935, Clemence Bouloque explores a legacy of love and moral courage. For many, Regina's motherly presence gave them the power to cling to life during a hopeless time. Ruby Namdar will explore the power struggle between the bible's Sarah and Hagar. Two women, two children, one inheritance.